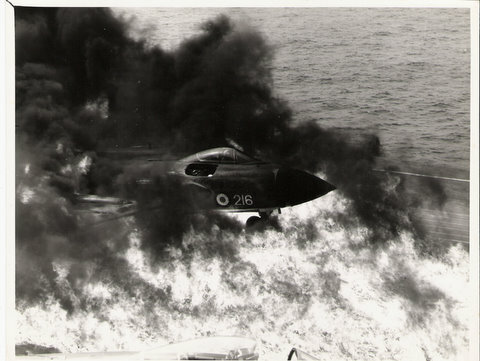 Mark 1 Sea Vixen of 892 Squadron prang on HMS VICTORIOUS 8th February 1961. We were off the west coast of Africa on our way to Capetown, with no diversions, and Paul called in saying he could not transfer fuel from his starboard drop tank. It was decided it would be prudent to land him on last. These photos show that this was a good idea. Picture 1. 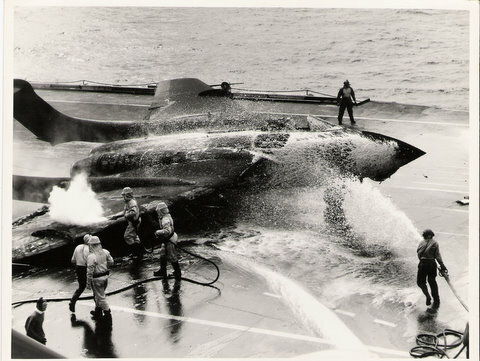 Paul made a good smooth landing but the starboard oleo collapsed due to the excess weight of full drop tank. 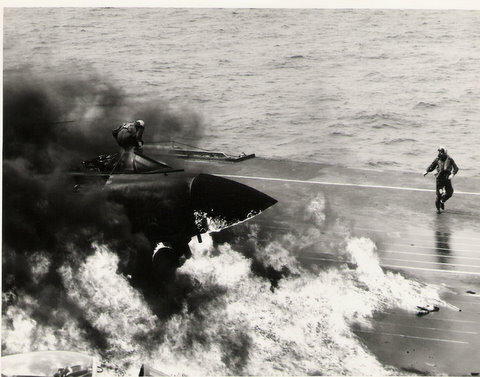 The drop tank detaches, hits the deck and bursts. Picture 2. Fuel burst into flames. Observer has jettisoned his hatch. Picture 3. 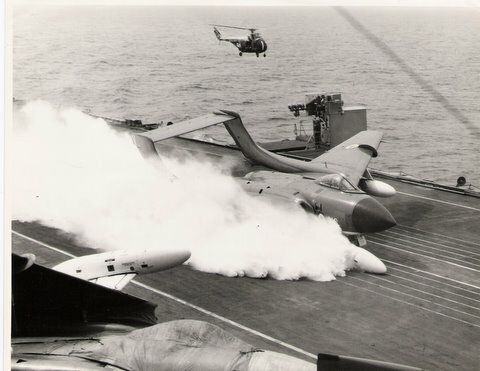 Pilot Paul Marshall on deck well away from fire. Observer, Mike Maddox, climbing across pilots cockpit to keep away from the flames. His Personal Equipment Connector (PEC) has snagged on the "O's" hatchway. The PEC connected aircrew to the aircraft oxygen.radio and anti g systems. Picture 4. Fire out. Some of the tail and starboard wing were reduced to a skeleton. This proved embarrassing when throwing cocktail parties in the Hangar at Capetown. All we could do was push it as far up the hangar as possible and hang canvas over the bits. Inspection showed that the oleo had a defect which caused the accident.